Too many assumptions impede problem-solving — Frank Stewart, Tribune Media Services, 2013. New theory suggests alternate path led to rise of the eukaryotic cell by Terry Devitt, University of Wisconsin-Madison (+PhysOrg.com +Newswise), 12 Dec 2014. "Russian scientists confirmed experimentally the possibility of life have been brought to Earth from space by meteorites during the return of the orbit of the satellite Foton - M ?4 said Alexander Slobodkin , scientist at the Institute of Microbiology, Academy of Sciences of Russia . "We were able to prove that one of our thermophilic bacteria survived on the surface of the meteorite during the passage of the dense layers of the atmosphere ," said Slobodkin XV Conference on Space Biology and Aerospace Medicine in Moscow. In the words of scientists from 11 thermophilic bacterial spores and 4 formed a line of bacteria survived for a flight to space and return to earth. The scientist had difficulty in revealing the precise amount of surviving microorganisms. See links to Russian news articles, What'sNEW, 20 Nov 2014. Cossetti C, Lugini L, Astrologo L, Saggio I, Fais S, et al., "Soma-to-Germline Transmission of RNA in Mice Xenografted with Human Tumour Cells: Possible Transport by Exosomes" [html], doi:10.1371/journal.pone.0101629, 9(7): e101629, PLoS ONE, 3 Jul 2014. The recent discovery of an interstellar molecule, isopropyl cyanide, C3H7CN with a branched carbon structure has been much publicized and hailed as evidence for the beginnings of life interstellar space. Whilst the researchers should be congratulated for the detection of a new class of interstellar organic molecule, arguing a case for the emergence of life on this basis is premature. The presence of branched structures is a common feature of molecules such as amino acids, which are the building blocks of proteins; but they are also present in the metabolites of biology and in their degradation products. It is of interest that the group of organic cyanides (R-CN) are produced in many organisms including algae, fungi and plants, and in some cases produced as defensive metabolites 1,2. In the absence of any evidence that the transition from non-life to life takes place readily and inevitably against all the odds, it would be my preference to argue that the new interstellar molecule simply adds to the storehouse of degradation products of biology in the dust clouds of space. Even more complex organic molecules have been found in space: the related What'sNEW article, 27 Sep 2014. 6:45 PM: Dear Brig Klyce, ...Anthropoids include monkeys, so the the first sentence should refer to monkeys, apes and humans. In the same paragraph refers to ASCs showing relaxed constraint among non-primates. The word "relaxed" generally implies that there was constraint initially, but then at some point the sequence stopped being constrained. However, there is no evidence that ASCs were ever under constraint among non-primates. So I would have described ASCs as having no constraint among non-primates. 1) It already existed in the ancestral mammalian genome, but it was not particularly important, and so it was free to evolve via random mutations. 2) It then gained some mutations in the lineage leading to anthropoid primates that rendered it useful to anthropoids. 3) From then on, many of the mutations in that segment of the genome were purged from anthropoid genomes by natural selection, and so the sequence diverged slowly among anthropoids. However, it still remained free to diverge at the background rate in non-primate lineages, because the non-primate version continued to be irrelevant to fitness. I really don't see how the existence of ASCs is surprising. This is how evolution is understood to operate. 27 Sep, 8:23 AM: Dear Shayam -- Thank you for responding to my message. I have aligned my text with the recommendations in your first paragraph. Thank you, also, for considering my comments about the ASC orthologs in non-primates. I understand the mainstream, darwinian explanation of evolution in this case. But I think it ignores something amazing: programs and subroutines that underlie features unique to primates were already present among ancestral species that lack those features. You suggest, "It then gained some mutations in the lineage leading to anthropoid primates that rendered it useful...." But I think the essential meaning of the sequence must already be there, already accessible. 23,849 anthropoid-specific constrained (ASC) regions with "robust functional signatures", the related What'sNEW article, 26 Sep 2014. Hoover | 8:05 AM: The famous Russian Cosmonaut Vladimir Solovyev just announced that diatoms and other marine plankton were discovered alive on the outside of the windows of the Russian Section of the International Space Station---surviving in the hard vacuum, thermal, and radiation environment of space. This is consistent with the detection of diatoms embedded in the interior of the Polonnaruwa meteorite stones described in a paper with Chandra and Jamie published last year in the SPIE Astrobiology Volume. In 1986, the late Sir Fred Hoyle and I proposed in a paper in the Journal Earth, Moon, and Planets that planktonic diatoms could be spewed into space along with water and ice ejected from Europa or from comets and transferred to The Earth. Richard B. Hoover, Fred Hoyle, Chandra Wickramasinghe, Miriam J. Hoover and S. Al-Mufti, "Diatoms on Earth, Comets, Europa, and in Interstellar Space" [PDF: 5Mb], p 19-45 v 35, Earth Moon and Planets, D. Reidel Publishing Company, 1986. F. Hoyle, N.C. Wickramasinghe and S. Al-Mufti, "Organo-Siliceous Molecules and the Infrared Spectrum of the Trapezium Nebula" [PDF], p 63-69 v 86, Astrophysics and Space Science, 1982. ISS discover plankton and other bacteria on outside windows by Chandra Wickramasinghe, 19 Aug 2014. Plankton found in space, the related What'sNEW article, 19 Aug 2014. 11:42 AM: Dear Brig, Thank you for your interest in our recent paper and for letting us know about your commentary. As a matter of fact, we do not think the presence of underground reactions -- whether they're useful or harmful when amplified -- requires a cosmic ancestry. These activities are coincidental and simply arise from biochemical imperfection, i.e. no enzyme can be fully specific. Even DNA polymerases, which are among the most specific catalysts, have measurable substrate infidelity and hence catalyze side reactions (i.e. introduce mutations during replication). A biophysicist might explain the ultimate lack of perfect substrate specificity as a fundamental necessity arising from quantum processes. But more likely it is evolution itself what is limiting substrate specificity. For example, Dan Tawfik, a biochemist expert on enzyme promiscuity, has suggested that very high enzyme specificity is physiologically costly in terms of turnover rates (see http://www.ncbi.nlm.nih.gov/pubmed/20235827). Thus, we have no reason to believe that enzymes which are absolutely specific for a single substrate and do not display any underground activities would ever be discovered. If so, there is no need for theories like cosmic ancestry to explain the very existence of underground activities. 18 Aug 2014, 6:38 AM: ...In most cases, the reaction mechanism is the same, but the substrates / products are different. These cases would still qualify as different enzymatic reactions. But bear in mind that the underground activities are very weak, hence these are not multispecificities of the same enzyme. 12:28 PM: It is not just the same DNA, but also usually the very same active site of the same enzyme. To some extent the same enzyme can thus perform multiple functions, but the undeground functions are inefficient. Gene duplication can facilitate the functional specialization if selection acts on enhancing the underground function. This model is called as innovation-amplification-divergence, see Nasvall et al. 2012 Science. ...the set of known underground reactions has a significant potential...., the related What'sNEW item, 12 Aug 2014. 11:50 AM: Dear all, I would ask you to please remove my name from the above address list....We seem to go into science fictions and, not only I gave that up decades ago, but also do not have the time to convert the unwilling. For the willing, here follow a few statements. Bugs (love the all inclusive American word) have been present on the Earth for a long while, it so happen that many of them love carbon and particularly like Carbonaceous meteorites; they have been cultured from them as early as ...1965.
from Richard B. Hoover | c. 12 noon: ...It is astonishing and yet very clear that [prominent meteoriticist] seems to think that any discussion regarding the possibility of extraterrestrial life is "going into science fictions." I am also shocked that a Professor [the meteoriticist] would have such an apparent lack of knowledge of microbiology. The "bugs" known as Cyanobacteria are photoautotrophs that extract their carbon from carbon dioxide by the process of photosynthesis--hence they are not found living in coal, black terrestrial rocks or carbonaceous chondrites. Some of the smaller coccodial forms do live as cryptoendoliths in Antarctic sandstones, but they only inhabit regimes where sunlight can penetrate. Furthermore, If the jet black Orgueil and Murchison stones had contamination of any kind of terrestrial bacteria deep in their interiors, then [meteoriticist] would have been unable to do any meaningful work with them--of which [meteoriticist] has produced a considerable amount. Also most of the carbon in carbonaceous meteorites is locked up in the form of kerogen-like insoluble organic matter similar to kerogen. The carbon of Kerogen and coal is not in a form that can be utilized by ordinary organotrophs. The absence in the CI1 and CM2 meteorites of 12 protein amino acids, 2 nucleobases, DNA, RNA, ribose, deoxyribose and photosynthetic pigments such as chlorophyll and phycoerythrin seems to me to provide clear and convincing proof that these meteorites are Not contaminated by modern Cyanobacteria. from [a high-ranking NASA officer] | 9 Aug 2014 | 12:57 PM: An interest and appreciation that there is likely life elsewhere is not the issue. It is really the quality of the evidence presented, and the acceptance that there are other hypotheses that are more likely for a particular dataset. Especially these datasets. As [meteoriticist] pointed out, bugs (e.g., Earth life) love to eat meteorites, and don't feel obligated to accept our limitations in finding a way to get to them. Only the short-sighted think that microbes don't know this game better than they! And given a meteorite that landed in a swamp, and spent quality time in a leather bag when not on display under glass, one really has to bend over backwards to posit that microbes in the meteorite must have come from space! If so, where in space? -- and let's go there. from Richard B. Hoover | 11:40 AM: These are not mere "claims" but the result of almost two decades of ESEM and FESEM studies carried out in the US and independently in Moscow by Academician Rozanov, Director of the Paleontological Institute (RAS) with many different samples of CI1 and CM2 carbonaceous meteorites. Filamentous heterocystous cyanobacteria and diatoms are large and have distinctive and highly recognizable morphologies and sizes that have for over two centuries formed the basis for their taxonomic classification. These microorganisms are photosynthetic and do not "eat meteorites" to obtain their sources of energy and carbon. None of the CI1 carbonaceous meteorites studied (Orgueil, Alais, Ivuna) were recovered from a swamp. CI1 meteorites are all very friable and they rapidly disaggregate into black minerals and particulate dust when immersed in liquid water, so no CI1 has ever been recovered from a swamp. ...Why do you say that you find it strange that extraterrestrial life would look like Earth Life? What do you know about extraterrestrial life? We now know from stable isotope analyses that the CI1 and CM2 meteorites are most certainly extraterrestrial. We also know that these meteorites contain extraterrestrial water, amino acids and nucleobases. There is strong evidence that these meteorites are probably are the remains of water-bearing C-asteroids or comets. Comets and C-asteroids have water-ice interiors( that could have preserved and protected viable microorganisms during atmospheric entry) and they have been bombarding the Earth for 4.5 billion years. Hence, any one of these extraterrestrial bodies could have delivered intact viable microbes to Earth at any point in it vast history -- in which case microfossils in meteorites could look like microbes found living on Earth today. Therefore there is no need of the Earth return hypothesis suggested by Alberto Fairen. Furthermore, there are a variety of EDAX data and associated biochemical lines of evidence that establish that the fossils found within these meteorites are not possibly interpreted as modern biological contaminants. from [astrobiologist] | 12 Aug 2014 | 1:54 AM: Dear Richard, The cyanobacteria, diatoms etc you analyzed in the meteorites are ideally adapted to life on Earth, to life on a planetary surface. So, assuming you are correct and they indeed come from space, where is the source? An origin of these organisms in a comet would make no sense for me from an evolutionary biology standpoint as life thrives always to be ideally adapted to its environment. If they originated in a comet far from Earth (which I have a very difficult time to envision as an origin of life location, but let's go there for the sake of the argument), not only would they likely have a different biochemical make-up given all the different potential building blocks, but they would be optimally adapted to life within a comet (in which case even photosynthesis would not make much sense either, because on the near-surface of the comet there could not be liquid water, radiation is too strong etc). Thus, the source would have to be a planetary surface. But where could that be? The only realistic potential source I see would be the surface of the terrestrial planets Venus, Earth, and Mars, on which liquid water surface bodies were present early on. And perhaps, may be, just may be, some of the ejected material ended up in a similar location of the Solar System as the cometary and asteroid material, impacted each other, and dormant "terrestrial planet" microbes were exchanged during impacts. And eventual after a long journal ended up again on Earth and were found and analyzed (by you). from Richard B. Hoover | 10:45 AM: Dear [astrobiologist], I simply do not know where, how, or when the origin of life occurred, and I have chosen not to speculate on this question. I did not ever suggest that these organisms originated on or in a comet. However, for there to be life in a comet it does not have to have originated within a comet. ALH84001 other SNC and lunar meteorites on Earth clearly prove that impact ejection can transfer near crustal planetary material into space and onto other Solar System bodies. The numerous craters observed on comet 67P/Churyumov-Gerasimeko prove that it has collided with many bodies in space. If only one of those had been ejecta from Earth, Mars or any other body containing viable microbiota it could have come have become a home for life. Smooth areas on this comet may have resulted from recent flows of liquid water from melted ice that has recently re-frozen. I do not accept your argument about the impossibility of photosynthesis or life in a comet. During the 2008 Lake Untersee Antarctica Expedition, I collected samples of living cyanobacteria from mud sediments 90 meters beneath the thick ice sheet that perennially covers the lake. Dale Anderson obtained wonderful videos of living red cyanobacterial stromatolites on the floor of Lake Untersee. Deep liquid water pools beneath a thick smooth recently frozen ice crust on a comet would provide superb protection from radiation. Cyanobacteria can carry out photosynthesis at low light levels under thick ice sheets. As John has correctly pointed out, there are a few species of Synechocystis spp. and nitrogen fixing Anabaena spp., Nostoc spp, that are facultative heterotrophs. These cyanobacteria are normally are photosynthesizers but also can grow by metabolizing sugars during periods of total darkness. In the studies of heterotrophic cyanobacteria, they were grown in the dark in a liquid water nutrient media containing sugars. There are also a few species of diatoms, like Nitzschia alba that can grow in total darkness. Some are even able to use AIB, as I mentioned in the 1986 paper with Sir Fred Hoyle on Diatoms. Heterotrophic metabolism could occur by heterocystous nitrogen fixing cyanobacteria deep beneath the dark crust of a comet (perhaps even when fairly far away from the Sun) as long as there is enough energy from radioisotopes or heat absorbed by dark rocks to melt the ice and form interior pools of liquid water. However, when a comet approaches the Sun, high light levels could exist even beneath thick layers of recently re-frozen blue ice and stimulate rapid growth of photosynthetic organisms. ...I am not speculating about the existence of microfossils of cyanobacteria, diatoms, acritarchs and hystrichospheres within the interior of regions of freshly fractured CI1 and CM2 meteorites.They are there and they are not recent contaminants. I have documented, photographed and analyzed very many of them by EDAX. I have also studied living and ancient biological material by EDAX and it is possible to distinguish recent biology from permineralized microfossils by several independent techniques. 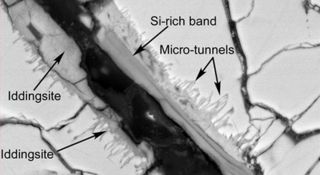 I have found and documented modern terrestrial fungi and other microorganisms as contaminants of the surface and in old cracks in CI1 and CM2 meteorites. But these contaminants contain nitrogen and behave differently under the electron beam during long EDAX spot analysis than do the fossils, so they can be recognized. I welcome the discussion am always am happy to consider all manner of inconvenient facts. Now my own. [to NASA officer] ...If the CI1 meteorites are all contaminated by modern biology:How do they tell us anything about the early Solar System or the origin of life? How is it possible for these meteorites are heavily contaminated by the "bugs" as [meteoriticist] suggests that they do not contain a host of life-critical biomolecules? How could the careful studies of the stones that have been carried out by [meteoriticist], as well as Cronin, Bada, Engel, Kvenvolden, Martins, Callahan, Cooper and other meteorite researchers have failed to detect find other stable proteinogenic amino acids; all 5 nucleobases, DNA, RNA, chlorophyll, glucose, sucrose, ribose or deoxyribose or proteins that can be stable over millenia? ftom Gilbert Levin | 13 Aug 2014 | 10:01 AM: Wow! I cannot believe how much smoke the new paper by me and Pat has generated! What bothers me, however, are the several non-scientific statements of "fact" made by some. Apparently, life beyond Earth is a subject some cannot view objectively. I have suffered for years from people who reject the Viking LR evidence for life without giving true scientific reasons, or, worst yet, as ALL critics have done, without considering the controls! NONE of the many published papers purporting to explain away the Viking LR has considered all the controls! They just ignore these uncomfortable facts and do not mention them. Statements like "The consensus rejects the LR data" just don't cut the mustard. Rejections must be specific. And [NASA officer], when you say I am "beating a radio-labeled horse again and again," you seem to forget it took much beating of the round Earth horse to get that fact across, and some apparently still belong to the Flat Earth Society! Yes, 2+2= 4, but it must be repeated over and over for some, dead horse or not! ...I now ask you again: when you consider all the responses the LR got from the Martian soils, including the controls, what other evidence would be needed were the experiment considered as a normal experiment instead of invoking spooky stuff at the distance of Mars?? Or, what else could produce such data but metabolism? Just name something! Sure, we could have nice moving pictures of microorganisms slithering around, but are they needed? And wouldn't some then say they were just thermally motivated mineral formations? At the time of Viking, Jerry Soffen and Chuck Klein trying to explain away the LR said it might have caught "chemistry turning into biology." And, much more recently, one of you (I'll spare you the grief) said the same thing! Well, I happen to believe that chemistry and physics behave the same on Mars as on Earth - and biology, too! We are probably one biosphere. When we have microbes living in the ice of the South Polar Cap where the temperature never rises above minus 15 deg C, why is it so difficult to believe that microbes can grow on Mars?? And, [meteoriticist], I let you off the hook of commenting on the LR, but you seem to reject the finding of non-contaminated extraterrestrial fossil-like objects in meteorites in which you report extraterrestrial pristine amino acids. It seems difficult to have it both ways, but this does permit the denial of even extinct life. After so much work by so many has been done to isolate non-contaminated extraterrestrial objects, why is it not accepted - even when solid scientific evidence is presented, such as the lack of many of the terrestrial life essential amino acids and nitrogen and, I believe, the extraterrestrial isotopic ratios of the objects found?? [Astrobiologist], while you claim the LR detected hydrogen peroxide life, you don't seem to call that the discovery of life! Anyway, why go such a difficult route as you propose for hydrogen peroxide life when terrestrial-type biochemistry satisfies the data? Also, since your original claim, it has been shown that Mars is not covered with hydrogen peroxide, nor even highly oxidized. The little bit of perchlorate found is insufficient to produce the LR Mars response AND perchlorate survives several hundred degrees of heating, so it could not be the agent tested in the LR controls! What is so unreasonable about accepting the strong LR data that have no contra finding, especially now in view of the post-Viking understanding that living things can travel between Earth and Mars and that some Earth microorganisms can live under Martian conditions? ftom Gilbert Levin | 12 Aug 2014 | 12:10:42 PM EDT: Dear [Cosmos Club staffer], ...I was the Experimenter on the Labeled Release life detection experiment aboard the 1976 Viking Mission to Mars. The experiment got positive results for microorganisms in the soil of Mars, but, for a variety of reasons was discounted. As Curiosity finds Mars habitable, people are now starting to pay more attention. Last week, at the Mars Society Meeting in Houston, a paper written on the subject by me and my Co-Experimenter, Dr. Patricia Ann Straat, created quite a stir. There are more than 50 comments about it online. The topics now encompass all possible extraterrestrial life. In addition to life on Mars, much of the debate centers on objects termed microfossils found in meteorites, many by Richard Hoover, former NASA scientist. He suggested I see whether the Cosmos Club might sponsor a debate/discussion on the subject of extraterrestrial life. Paul Davies, John Rummel, Richard and myself would be among those willing to appear, as might Dirk Schulze-Makuch, Sandra Pizzarella, and others we could identify. I think it would be a very exciting, well-attended program. from Richard B. Hoover | 14 Aug 2014 | 12:11 PM Dear [NASA officer], ...First, I should mention that many microbes have enzymes and diatoms have "ice active substances" that allow them to live inside the ice of glaciers polar ice sheets. Thin films of pure water also exist in permafrost. In the dry, cold, polar regions of Earth cryptoendolliths inhabit regimes within sandstones where sunlight can reach. The liquid water is trapped in thin films between the sand grains. Cryoconite communities also inhabit regimes of liquid water under dark rocks and covered over by frozen sheets of ice. This makes a microniche in which even on comets, icy moons or on Mars, pressures could build up as gases are produced by photosynthesis to form small ecosystems with their own entrained atmospheres---allowing pressures much higher than needed to maintain water in liquid state even if there is no atmosphere above the rocky/icy crust of the comet, asteroid, icy moon or Mars. These are the places where we should look for extant extraterrestrial life. Hopefully at some point in the future, NASA will become interested in flying a life detection experiment or sample return mission. Until then, the most exciting discoveries may be made by missions principally from ESA, Russia, China or other Space Programs. ...For over two decades, I have also been very much hypersensitive to the problem of contamination, as I followed the organized element debate and discussed it in detail with the late Sir Robert Ross of the British Museum while I was doing the Inventory of the Henri Van heurck diatom collection in Antwerp. My acute sensitivity to that debate is why I only work with freshly fractured interior samples of the meteorites and flame sterilize all instruments, stubs and tools. I am very much aware of the "Organized Element" debate over Orgueil and how Anders and Fitch "won" the debate and cut off all work on the study of possible microfossils in meteorites by claiming to have uncovered a Hoax (supposedly perpetrated in the 1860's and then discovered by them) with their "Contaminated Meteorite" paper in Science. I have found contaminants on the outer surface and in old fusion cracks of several carbonaceous meteorite. These modern contaminants contain measurable levels of nitrogen and can also be recognized as modern by their behavior in the electron beam. I have not found evidence of modern microbes deep within the interior of the CI1 and CM2 stones and many of the other carbonaceous meteorites I have studied contain no evidence whatsoever of microorganisms. All 23 protein amino acids? Only 8 protein amino acids have been found. All 5 Nucleobases? Cytosine and Thymine are absent. Ribose and Deoxyribose? Life-Critical sugars are absent. This constitutes strong evidence that the interior of these stones have not been invaded by bacteria. I have yet to hear a logical hypothesis as to how that would is possible. The reason why fossil microbes and diatoms are similar to their modern terrestrial counterparts is that they all came from space in the first place, and continue to do so. Life on Earth is an expression on the Earth of a Darwinian evolutionary scheme that has taken place over a vast cosmological scale. Not so long ago it would have been thought impossible to find the same species in opposite hemispheres of the Earth. The connected biosphere of the Earth has now to be considered connected to a vast cosmological biosphere within which frequent exchanges of genes have established a unity of all life in the cosmos. Chandra Wickramasinghe | www.profchandra.org Influenza from Space? is a related CA webpage. The encounter of the European Space Agency's Rosetta spacecraft with Comet Churyumov-Gerasimenko has generated a wave of media excitement that is surely well justified. However, science reporters and commentators who have described the comet as a "hurtling lump of dust and ice" have unwittingly downgraded the importance of the mission. They take no account of discoveries spanning more than three decades, indicating a large carbonaceous content of comets that gives rise to their dark, coal-like surfaces. Consistent with the theories of the late Sir Fred Hoyle and the present writer, the connection between comets, life and evolution has developed to the point that a life-detection experiment on the Rosetta lander would have been amply justified. However, for mainly cultural reasons, such an experiment was not included in the mission, and in the event only indirect support of a comet-life connection can be expected from this mission. The rendezvous with the comet that was achieved on 7 August 2014 has led to stunning close-up images of its surface. Rough terrain of low reflectivity appears to be interspersed with smoother areas that could represent recently exposed subsurface lakes that were laden with microbial life. The high rate of outgasing that has been observed from early June points to the action of microbial life within such sub-surface lakes. More evidence – albeit indirect evidence – pointing to our cosmic cometary ancestry is likely to be unravelled from experiments to be conducted in the Rosetta mission in the months that lie ahead. 6-12 Aug 2014: Rosetta updates. Back in March 2004 when the Rosetta Mission took off on its 10 year journey to COMET 67P/G-C most people did not even believe that water existed off earth. Although we thought we understood what life was, now we realize our science was simplistic. It should be no surprise to learn that the Rosetta Mission has no life detection experiments. We were only just beginning to understand the importance of viruses and bacteria in their symbiotic role with earth's life. In those days, we had little understanding of how these microbes affected the development of the human genome. Today space science and astrobiology has changed considerably. Even NASA has reoriented its overall mission from "The Search for Water" to "The Difficult Endeavor of Searching for the Signs of Life". So now, in 2014, we recognize that water is everywhere in the solar system. On the moon, on MARS, on the moons of Saturn and Jupiter and even on COMETS. Working with the visionary Sir Fred Hoyle in the 70's and 80's Professor Chandra Wickramasinghe theorized that the dark regions of the spiral arms of the galaxy was not simply "empty" but was the place where complex molecules could be found and even "the seeds of life". He hypothesized that Long-Period Comets were one of the prime carriers of these seeds of life from star to star. It gives me great pleasure to see how human consciousness has evolved since those days. By 2013, with the latest Kepler Mission estimates of habitable planets, Panspermia finally moved into mainstream science. The next stage will likely be evidence that "Life is a cosmic phenomenon" . Using remote and even local spectroscopy, Rosetta's arrival at Comet 67P will contribute to this advancement of our knowledge of astrobiology. This year, movies like "Gravity" educated and inspired the next generation of human explorers. Now this "Real world" mission called "Rosetta", where we explore an object far away from earth, orbiting the sun itself, and landing on the Comet in "prime time", will inspire the younger generation and encourage them to work together rather than fighting against each other. One of the most significant features of the Rosetta celebrations this week was seeing the Germans and French celebrating their co-operation and their mutual success. I predict the actual landing on the Comet 67P, planned for November 2014 (later this year) will be as exciting to the "X" , "Y" and "Z" generations as was the landing on the moon to my generation back in 1969. 4:40 AM: Brig "It's not clear exactly why the Ordovician meteor shower led to a greater variety of life on the planet although some more far-fetched theories suggest that life itself was 'seeded' by organisms hitching a ride on asteroids." Some people have a real problem accepting panspermia even as a possibility. Nevertheless some interesting links are provided in the piece. Scientists discover fragment of 'missing link' asteroid that led to explosion of life on Earth by James Vincent, The Independent, 3 Jul 2014. 1:03 PM: Brig, you should check out this book. The author sent me a copy to review, and it is an eye opener. The first half documents the ways in which the early (and some recent) Darwinians evaded technical critiques of natural selection through various means that had little to do with practicing good science. The author makes the case that Darwin, Galton, T. H. Huxley and the rest were essentially eugenicists who championed natural selection theory precisely because it could be used to justify eugenics and other less direct forms of class warfare. The author points out that the idea of natural selection had been around long before Darwin, but it never gained much traction among scientists, because it didn't make sense conceptually, and it didn't agree with what was observed in nature. It took the hard work of these eugenicists to give the theory even a precarious place among scientific ideas. You'll find the book to be a very engaging read. 3:59 PM: Thanks. Downloading the Kindle version. 22 Jun, 10:55 AM: Dear Ken – Now I have read the book. ...Some of the revelations about Darwin's motives were striking. That was worth knowing, although some of that message was hammered too hard. I'm glad Bennett knows that genes are very old and that horizontal gene transfer is important. Also, he praises Lynn Margulis, Barbara McClintock and Richard Goldschmidt; good. But I did not find his solution to the formation of life edifying -- self-assembly and emergence cannot write genetic programs. In all, the Darwin critique made the whole book worthwhile. I may chose some quotes for posting. Thanks for the recommendation! 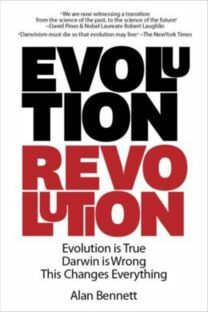 Alan Bennett, Evolution Revolution: Evolution is True. Darwin is Wrong. This Changes Everything. ISBN-10:0989189104, Lexem Publishing, 7 May 2014. 9:58 AM: Dear Brig: Space.com has a brief article today that describes NASA's search for low-cost yet high return mission to Europa. Elizabeth Howell on Universetoday.com has an article on the role of biology on mineral formation, with implications for exobiology. I think that any proposed Europa mission should find a way to use Jupiter's radio emissions as a large burst transmitter radar that can probe under the ice. PS: I've been a big fan of your website as long as I can remember-my Dad's mentor in geology at Wichita State was Paul Tasch, who was out during the IGY looking for meteorites with traces of fossil organisms. It is a shame that no one seems to have gone back and re-analyzed the fossils he was examining. Life on Europa, Other Moons, Other Planets? has relevant links. Thanks for the kind words, Gordon! How does this fit within Cosmic Ancestry - Are they ignoring CA as an explanation? 7:58 AM: It's often thought that evolution is fueled by competition, with red-in-tooth-and-claw dynamics generating new, better-adapted forms and species. But sometimes – perhaps frequently – new species just happen. Above and at right is a map of greenish warbler distribution, color-coded according to local genetic signatures, around the Tibetan plateau. The warblers are what's known as a ring species, occupying a horseshoe-shaped range; as neighboring populations intermingle, genes flow around the horseshoe, but populations at its tips no longer interbreed and eventually become different species. At left is a computational model of this process. According to the model, no adaptations or differences in reproductive fitness are necessary to produce new species. Rather, they seem to arise as a function of time and space; evolution itself is a generative, diversifying force. Citation: "Evolution and stability of ring species." By Ayana B. Martins, Marcus A. M. de Aguiar and Yaneer Bar-Yam. Proceedings of the National Academy of Sciences, March 11, 2013. 10:09 AM: Dear Ronnie — I have always thought that speciation is possible within strictly Darwinian evolution. Species can become reproductively isolated from each other by the evolution of some incompatibility. HGT and viruses could be involved, but not necessarily. Speciation is not necessarily inventive, to say it another way. New features (lungs, brains, ears, etc.) do require invention. This is where CA is necessary, to me. And speciation may allow an isolated population the freedom to implement a new invention. But speciation, by itself, seems unremarkable to me.